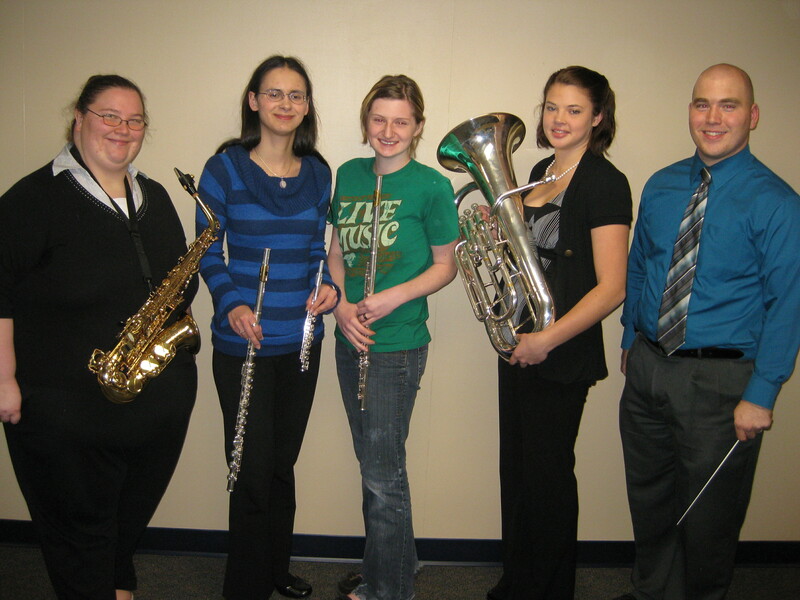 Four Silver Lake College Students have been accepted into the National Band Association Wisconsin All-Star Band. Honored students include Allison Shackleton (freshman instrumental music education major from Neenah) playing flute, JoAnn Kleckner (senior art and math major, music minor from Two Rivers) playing flute, Amanda Dumovich (junior instrumental and general music education major from Sheboygan) performing on alto saxophone, and Meaghann Frank (freshman education major and music minor from Plymouth) performing on euphonium. Silver Lake’s Instrumental Music faculty member, Jeremiah Eis, has been selected as one of five Wisconsin Band Directors who will share the podium in rehearsal and final performance of the NBA-WC College All-Star Honors Band at their program at the Annual Convention, 9:00 pm on Friday, January 21, 2011 in the Lincoln High School Performing Arts Center (PAC) in Wisconsin Rapids. There are 19 Wisconsin colleges/universities participating to form a Band of approximately 100 students. The musicians selected for nomination by each school are among the top and most dedicated music students.